Boomwhackers - Fun for all Ages! Haven't heard of Boomwhackers? These fun, color-coded, plastic percussion tubes are tuned to musical pitches and have become a favorite classroom instrument around the world! Whether teaching kiddos about basic music concepts, booming along to your favorite songs, or channeling your inner Blue Man Group, these tuned percussion tubes offer something for everyone! Come pick up a set of Boomwhackers this weekend...and then join us for our Boomwhacker Workshop (for ages 2 to 6) this Sunday from 4pm to 5pm! One part ukulele, one part resonator, the Gold Tone ResoUke combines the best of both worlds with the comfortable playability of a concert scale ukulele and a brass body that projects a loud, distinct tone unlike any other ukulele in your collection! The Gold Tone Resouke features a reverse-cone resonator with biscuit bridge and the resonant brass body carries the sound with beautiful echoing lows and clear, cutting strums. The Gold Tone/Beard resonator coverplate features a removable palm rest, so there's no need to detach the strings and remove the entire coverplate in order to adjust string action, break angle, string spacing or to replace the bridge saddle. The palm rest can also be shimmed to different heights for perfect right hand comfort. The ResoUke also features a bone nut, a Canadian hard rock maple bridge saddle, 14:1 geared Kluson-style tuning machine heads and custom-gauged Aquila Nylgut strings for the best possible tone. This uke is a rare one for our shop, but we’re lucky to have this very lightly used instrument available now with nice, poly-foam case included. These guys are regularly priced around $450, but you can take this one home for our Friday Feature price of only $350! We are very excited to have Seymour, Indiana luthier Alan Brittingham join our family of builders here at Weed Patch Music Company! Alan is known for his amazing guitars (which we also carry) and his work with the Marc Adams School of Woodworking...but today we feature this unique short-scale dulcimer that Alan also built! Reminiscent ot the McSpadden Ginger model dulcimers, but with a sound and look all it's own, this is one you should definitely check out! This incredibly unique dulcimer features a Walnut Top/Sides/Back, Maple Neck Blocks, Ebony Headstock/Fingerboard/Bridge, Black/Blue Maple Rosette, Green Abalone Shell Inlay and Fret Markers, Black Corian Nut and Saddle, and Cosmo Black Gotoh 510 Mini Tuners. Regularly priced at $399.95 but available this weekend for 10% off! This Vintage Harmony "Singing Cowboys" Acoustic Flat Top Guitar is a true Vintage Collector's Item! Made in the USA by Harmony (Supertone) between 1938-1943, this guitar was one of the "Cowboys" series of guitars made by Harmony and sold by Sears, Roebuck & Co. beginning in the 1930's and carrying on throughout the 1960's. In the depths of the Great Depression, people turned to entertainment for distraction, and one such entertainment was the music of Gene Autry and other "Cowboy Singers" frequently heard on radio programs and later television and movies. This guitar series made by Harmony paid homage to these great Cowboys. This Vintage Collector's guitar features a stenciled Western Chuck Wagon Scene and is equipped with a new chrome tailpiece, rosewood flat-top floating bridge, new open-gear tuning machines, and new nut. This guitar is all set up and ready to play or take it home as the perfect addition to your Vintage Guitar Collection - only $119.99! The Recording King Dirty 30’s Series 7 is a Single 0 Guitar with a sound that will definitely impress you! Whether headed out on the road or matching the vibe of an intimate session is your go-to-guitar for that woody, boxy vintage sound! With super clean Cross Lap bracing and top quality materials, the Series 7 packs a punch. For a classic vintage sound, unique look, and easy playability, this is the guitar for you. On Sale this weekend for 10% off!!! The Clarke Tin Whistle Gift Set includes a Clarke Key of D Tin Whistle, 80-page Handbook, 74-minute CD, Tunes from Ireland, England, Scotland, and Early America, and Instructions for all levels of players! This is the perfect Christmas gift for the one you love! Our feature this week is the Gold Tone BU-1 Banjolele! 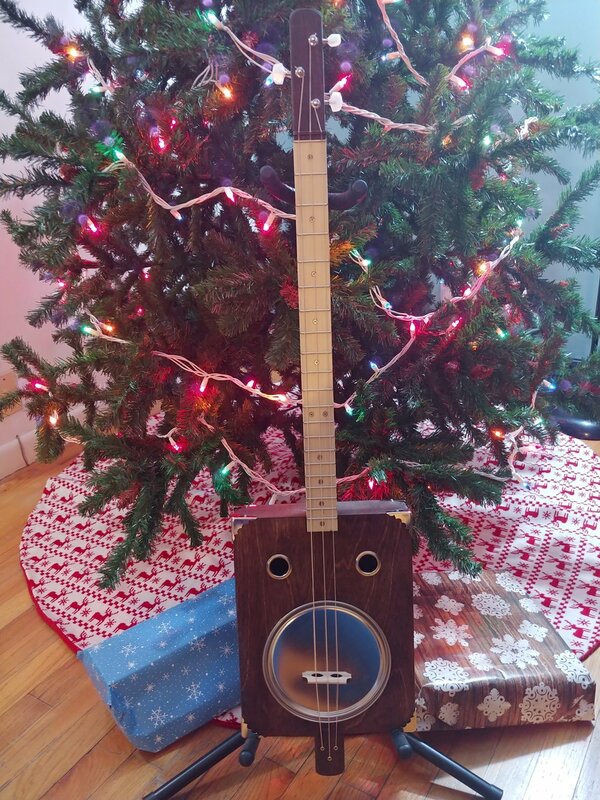 This is one of our favorites…and it’s the very last banjolele that we will have in stock before Christmas!!! Only $199.50 this weekend! Come and get it! The Gold Tone BU-1 Banjolele (with pickup), Gig Bag Included! This openback concert-scale instrument is the only banjo uke at this price point to come with a factory-installed pickup for easy amplification. It has an eight-inch maple pot crowned with a genuine Remo Fiberskyn head, a hard maple neck, a graceful vintage-style tailpiece, and Gold Tone’s patented Zero Glide nut…AND it comes with a padded gig bag! Super fun to play! Check it out! 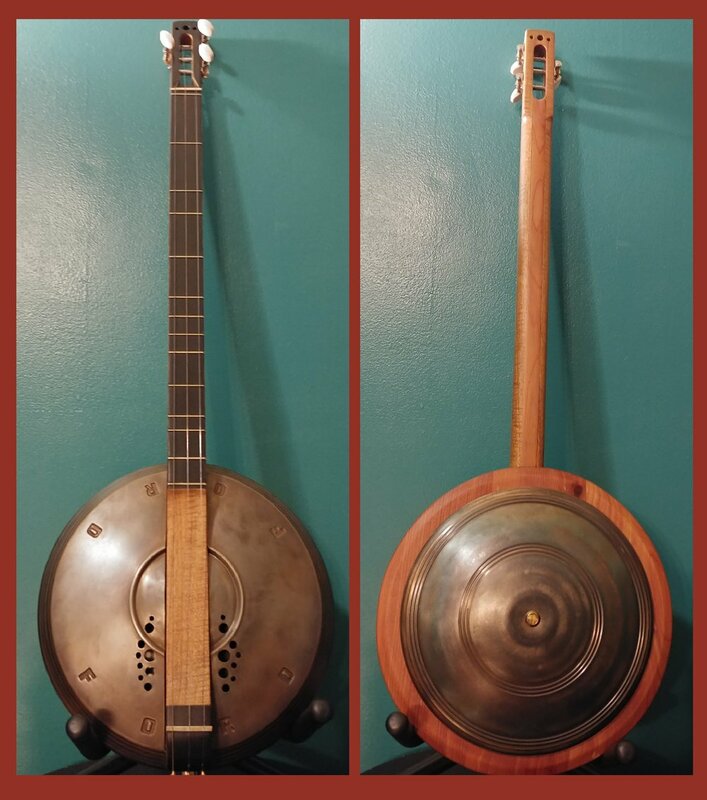 Enjoy two different ways to take advantage of our Friday Feature Special this weekend with 10% off either the Completed 3-string Acoustic Paint Can Resonator Guitar (built right here at Weed Patch Music Company) OR build your own with 10% off our Paint Can Resonator Guitar Kit created by CB Gitty! This incredible 3-string Acoustic Paint Can Resonator Guitar sounds like the Deep South, circa 1928, delivering the iconic classic Delta Blues tone due to the paint lid resonator! Play it fretted or use a slide - the choice is up to you! And, if you’d like to try your hand at building your own, our Paint Can Resonator Guitar Kit includes everything you need to build your own using just simple hand tools! This weekend only you can receive FREE ENTRY to our upcoming Holiday Banjo Workshop with the purchase of any banjo in our store! 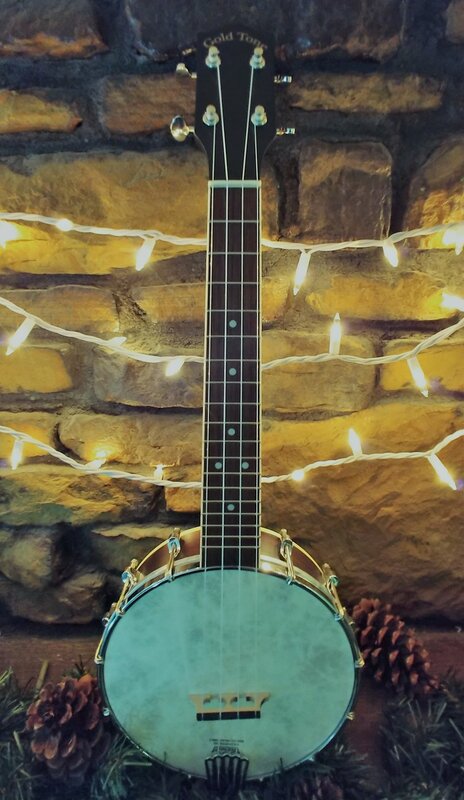 Once you’ve got your brand new banjo, let us help you get started picking with our Holiday Banjo Workshop for Beginners (Saturday, December 16th from 4:30pm-5:30pm)! At this fun and festive banjo workshop we will use beginner banjo techniques and methods to learn how to play a popular holiday favorite! This banjo workshop is perfect for beginner bluegrass banjo players who are looking to improve upon their techniques, add a new and familiar song to their repertoire, and get a chance to play with other beginner banjo players! Take advantage of our Special Offer this weekend and join us for some holiday fun! Click here for more information on our Holiday Banjo Workshop and other workshops coming soon! 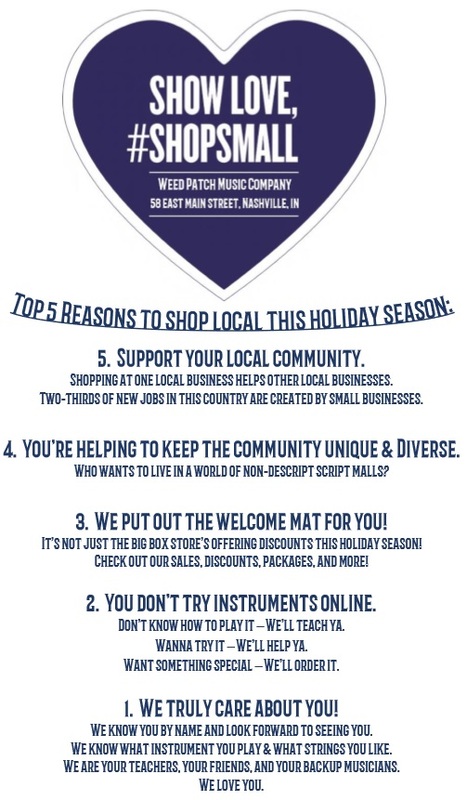 We would like to thank you from the bottom of our hearts for supporting small businesses this holiday season! This weekend we have so many Special Deals that there’s almost too many to mention! 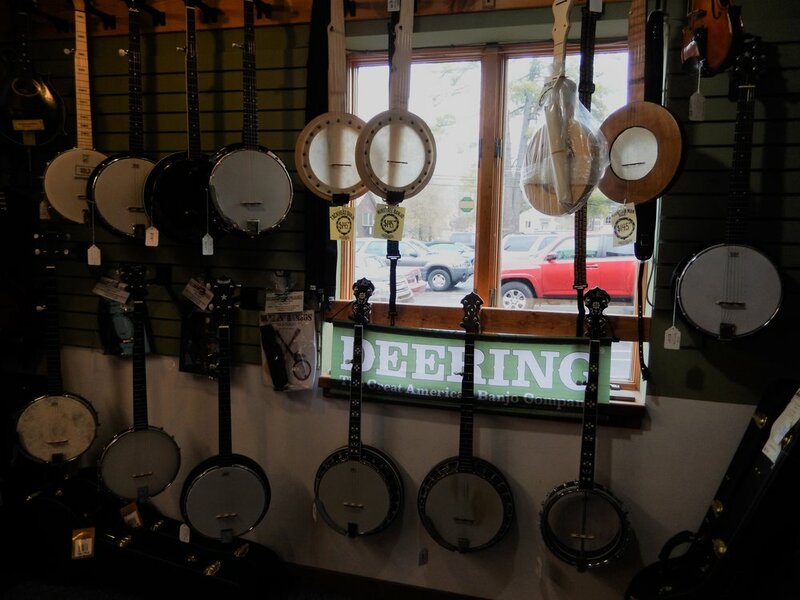 From Instrument Packages to Banjo deals to Free Gig Bags to Stocking Stuffers, we’re giving you lots of reasons to come and visit! Here’s a rare item that we don’t often have in stock - The Casio Casiotone CT-640 Keyboard! 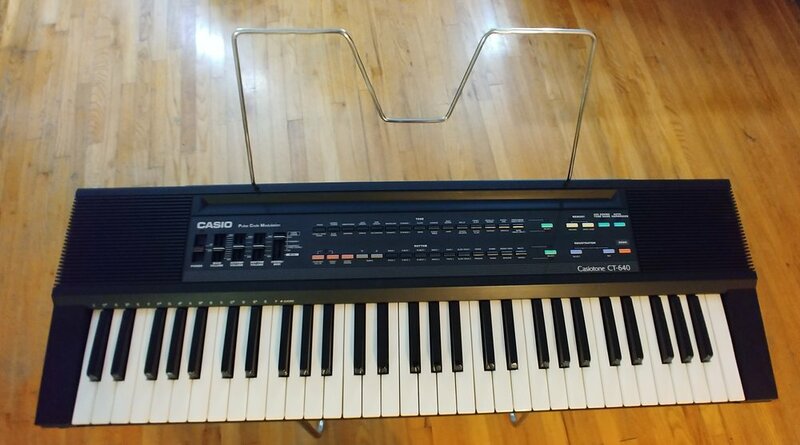 This was Casio’s first keyboard based on sampled sounds and we have one in like-new condition! This keyboard is bundled with a stand and power source adapter - everything you need to get started playing! It features 61 keys, 30 sounds, 20 rhythms, and 49 rhythm sounds. It has built-in speakers, is MIDI-enabled, and also accepts batteries as a power source. This will make the perfect gift for that new piano player in your life! Super affordable price this weekend only - $75!!! Don’t miss out! If you’re searching for an affordable beginner banjo that still looks good and sounds great, then the Morgan Monroe Rocky Top Hoedown Banjo is the one for you! This great beginner banjo from Morgan-Monroe Instruments is a fantastic playing banjo that gives someone starting out a pro quality instrument while the seasoned pro will appreciate the playability right out of the box! Vibrant and alive, this Hoedown banjo delivers all the tone any player could ask for without compromise! Available this weekend only as part of our Friday Feature Special with a Free Gig Bag - Resonator Version (with gig bag) only $169.99 and Open Back Version (with gig bag) only $159.99!!! The traditional squareneck design and vintage sunburst finish make the Recording King Professional Resonator an instant classic. Friday Feature Special Package Discount! Includes: Recording King RR-60-VS Professional Wood Body Squareneck Resonator Guitar, Deluxe Guardian Archtop Hardshell Case (CG-022-SQ), and Shubb SP-2 Stainless Steel Guitar Slide. Retail Price regularly over $850, but you can get it all this weekend for only $599.99!!!! Don’t miss it! For this weekend only, you can take advantage of a Special Package Deal Discount on this beautiful RR-60-VS Resonator Guitar, Deluxe Archtop Hardshell Case, and Shubb SP-2 Slide for only $599.99! For a savings of over $200 off of the combined list prices on these items, you really don’t want to miss this special deal! This weekend only! 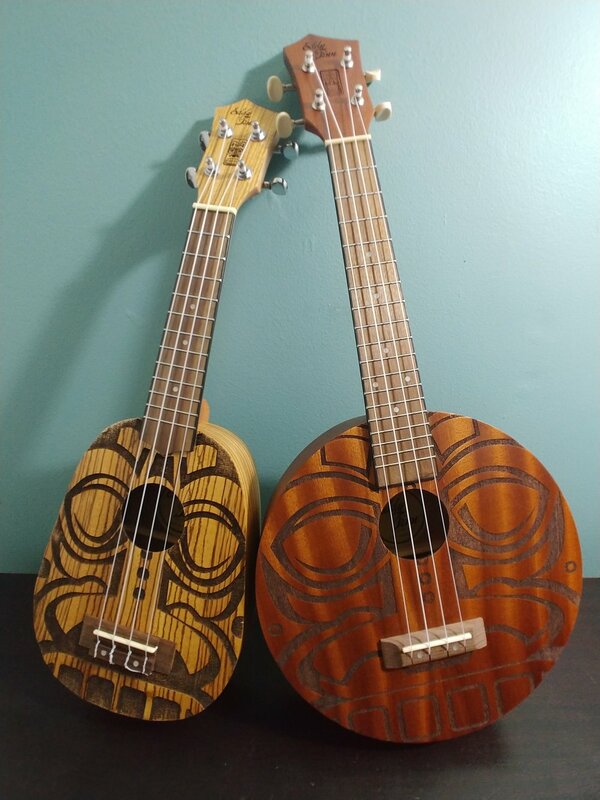 Eddy Finn is proud to introduce their new Tiki Top Ukulele Collection - Now available at Weed Patch Music Company! 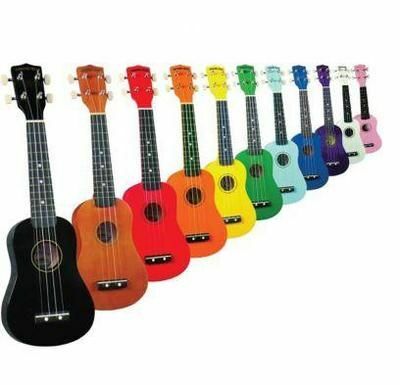 Get a special deal of 10% off any Tiki Top Ukulele in stock in our store this weekend as part of our Friday Feature Special!!! Each Tiki model has precision laser cut graphics depicting three different Tiki motifs on the body as well as the headstock face. Available in your choice of Soprano Zebrawood Pineapple Shape or Concert Mahogany Model with the ever popular Round Body Style! Contact us for more information on pricing and availability! These ukes won’t last long!! With a history from around the world, the Ocarina has an ancient, but international appeal. These vessel flutes have continued to inspire music from ancient Andean cultures through modern culture, especially a favorite of video gamers today! Check out our traditional Peruvian Ocarinas, all on special this weekend for 10% off our regular prices!!! The Ocarina is an incredibly easy instrument to learn to play - so easy that this ancient instrument has often been mistakenly classified as a children’s toy! While it’s great, small size make it a perfect instrument for children, this flute can also be enjoyed by adults of all ages! Simply place your lips to the mouthpiece and blow while opening and closing the finger holes to produce your desired note. Many of our ocarinas contain 8-holes allowing you to play a full major/diatonic scale (do-re-mi-fa-so-la-ti-do). This gives you the ability to play a wide range of songs while still keeping the simple and easy to learn element. And, all of our Ocarinas are fair trade products, handmade in Peru, and proceeds directly benefit the village artisans who worked to create them! Regular Ocarina prices range from $8.99 to $27.99, but this weekend you can pick up your own Ocarina for 10% off our regular prices!!! Tomorrow is the official first day of Fall, and in honor of Brown County’s favorite season, we will be offering 10% off any of our fabulous Gourd Percussion Instruments - Today and Tomorrow only!!!! 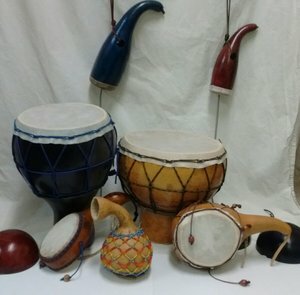 We are proud to carry a wide variety of Gourd Percussion Instruments, all handcrafted by local artisan Sue Westhues! Sue began her gourd creations with the planting of a single package of gourd seeds and the intention of creating a few birdhouses. Now Sue has created a full career of gourd art and instruments. Having appeared on the Home Gardening Channel and in several books and publications, she has gained quite a lot of popularity. We are excited to provide a variety of primitive instruments created by Sue, with everything from hand drums to friction drums to shakers and more! There is sure to be something for everyone!